ŠKODA is a company with global reach. While it still calls the Czech Republic home, cars emblazoned with the winged-arrow logo are also rolling off production lines in other countries and even other continents. A traditional Czech carmaker, ŠKODA currently offers customers a line-up featuring eight model ranges: the CITIGO, the FABIA, the RAPID, the OCTAVIA, the KAROQ, the KODIAQ, the KAMIQ (in China) and the SUPERB. The company is active in over 100 markets worldwide. What is more, ŠKODA cars are also made almost all over the world. The Czech Republic was, is and will be the home of the ŠKODA brand. ŠKODA runs three plants in its home country – it produces cars in Mladá Boleslav and Kvasiny and gearboxes for ŠKODA and other VW Group brands in Vrchlabí. ŠKODA has a worldwide workforce of more than 35,000 employees. Besides the Czech Republic, ŠKODA cars are also made in China, Russia, Slovakia, Algeria and India, mostly through partnerships within the Volkswagen Group. ŠKODA cars also make their way off local partners’ production lines in Ukraine and Kazakhstan. 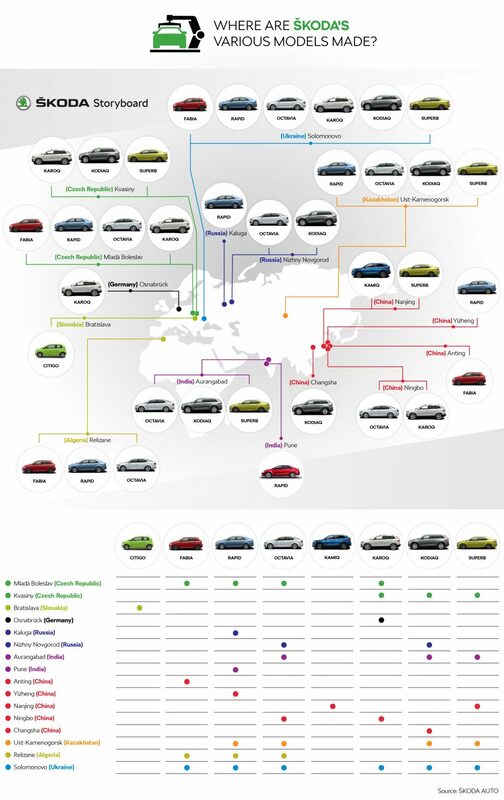 The following infographic shows which models are made in which production plants.